March 9, 2018 – Ten years ago, Hot Spring introduced a terrific new collection of hot tubs called Limelight. Boy, did they take off! The Limelight Collection was designed to appeal to a group wanting something a little more contemporary and high design in look and feel, with Bluetooth Music capability, cool lighting, and—of course—incredible hydro massage. Well, the entire lineup of Limelight Collection tubs has been re-designed for 2018. Once you get a chance to see (and feel!) them, you’ll clearly think stepping into the Limelight is right up your alley. Every tub has been thoughtfully redesigned, with spacious new interiors, enhanced LED lighting, fresh new cabinet designs, backlit water features and new jets to deliver the hydro massage everyone needs. 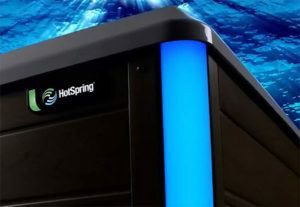 The biggest upgrade is to filtration, which has long been a Hot Spring benchmark compared to other hot tubs. Multiple filters mean more water cleaned continuously and water that’s healthier and easier to maintain. This, more than anything, really makes Hot Spring special. Pair the heightened filtration up with the exclusive ACE Salt Water System, and it’s absolutely elevated to a place in the industry that will make others envious. The smallest in the collection will certainly make you Beam. The Beam™ is a terrific tub that easily seats four. Its open styling, four corner seats and jetting will make you feel like you’re in hot tub heaven. It’s available in a 110V option—making 110V tubs that truly stay hot and are energy efficient is one of Hot Spring’s claims to fame. There’s also a 220V version if you’d like some additional jet power. Either version is amazing. If you own this tub, it’ll show you have Flair. One of Olympic’s best sellers, the Flair® has been updated and it’s stunning! Featuring seating for five and an incredibly comfortable lounge, you’ll find that you’re able to recline and get a truly terrific massage after a long day. Relax in a Flash™! We’re pretty excited about this all new model introduced this year. (Since the Flash is one of my all-time favorite comic book characters, maybe I’m geeking out a bit too.) This tub is perfectly sized at 7’0” square, making it ideal for most backyards—large or small. With open seating for six and a convenient cool down seat, you’ll find you have everything for your entire clan of friends and family. Seeing this gem in your backyard will quicken your Pulse. Another mainstay of the Limelight Collection, the Pulse® has been revamped and it’s a sight to behold. The interior feels bigger than ever, and you’ll find it’s quite easy for seven to hang out, relax and enjoy each other’s company. The ring of foot jets in the foot well give everyone a much-needed foot massage. Every way to relax in the spectrum will be clear when you sink into the all-new Prism™. When you see this tub, it will absolutely reinforce the concept of “go big or go home”! The Prism has seating for seven, an amazing lounge, and a totally new captain’s chair to indulge even the pickiest hot tubber. And—the incredible XXL foot jet will blast away any doubt you chose the right tub for you. Are you ready to step into the Limelight? Head to one of our showrooms. They’re all making their debut now, and we think you’ll be knocked out by what you see!